Eleven-year-old Mickey House is frustrated with his changing body ? most notably, the over-sized ears sprouting out of his head. A loner at school with an overbearing mother who still treats him like a child, Mickey finds his only solace in selling urine to his classmates for drug tests. As Mickey's imagination and toxic reality begin to blur, he must face the ultimate fact: growing up is not for kids. Guaranteed to ship today if ordered within the next 2 hours and 31 minutes. 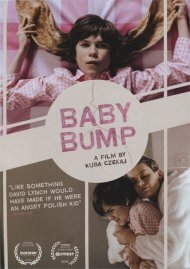 An outrageous and hilarious Polish import, Baby Bump is like a Walt Disney film directed by David Lynch. The film wowed audiences at the Venice Biennale, where it received the coveted Queer Lion prize. Absolutely gorgeous and equally mind-blowing, the film marks the arrival of a unique talent in writer-director Kuba Czekaj. Kuba Czekaj's "Baby Bump" is a wild, accurate, disturbing, confusing film and these all taken together give us a fun movie. Mickey (Kacper Olszewski) is growing up and as his body is changing, his thoughts go wild. The film is about his character and is told from his child`s perspective. It's a character study of a kind that focuses on the physiological and psychological changes that happen to everyone when innocence is lost and left behind. There is no consistent narrative and at times it is a bit vulgar. It is something of a black comedy; an Oedipal story of a small boy trying to pry himself loose from the suffocating attentions of his young mother. Kacper Olszewski's acting because of the structure of the film but he is cute and photogenic and sometimes quite repulsive.